Rudy demonstrates his niblet kisses on his brother, Jeffie. Just a little love bite. 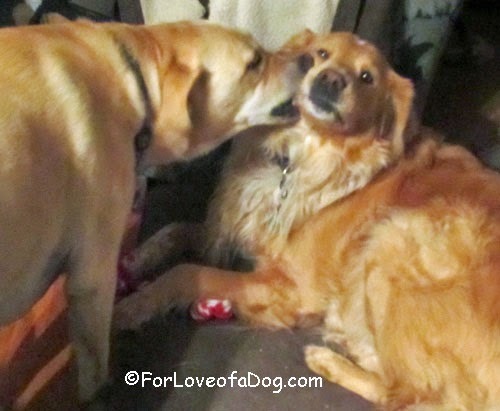 Our Sally's boyfriend Rudy used to do that nibble kiss...it was a little scary at first. Sometimes we like to play this way too! Its lots of fun! LOL looks like sibling love! nothin' like a little "love" bite! Oohhhh, we know what kind of "love" that is! BOL! Love bites are our specialty! BOL! So sweet. My boys flea bite each other from time to time. Awwwww.....a bit of bitey face is aways fun! Jeffie, you need to bite back...you look a bit unsure of what is happening. Luke uses that same technique on his sister Sheba! She pretty much takes it just like Jeffie seems to! So sweet of Rudy. But Jeffie doesn't look like he's enjoying it much. :) Pierson nibbles on Maya sometimes and she has the same look. I love it when dogs do the "flea" bite. Great photo. I love it. Leo would "nibble" on Harley's ear all the time. Oh that's so cute!! Mine never do this. Oh! Rita wants to nibble Jeffie's cheek like that! !